Today, we’re talking about pulses, because…. it’s the YEAR of the pulses! OK, so what are pulses? To be exact, a pulse is the dry, edible seed of a legume. What’s a legume? A legume is a plant that bears its fruits in pods. Legumes are vegetarian-friendly and are an excellent source of protein, are low in fat and are high in nutrients, making them ideal for those of you watching your waistline, or simply, for those of who are always trying to squeeze in healthy foods. *IQF means individually quick frozen, sold at many grocery stores in the freezer section, for examples, click here. The appeal of IQF is you don’t get the added sodium of canned products but don’t have to rehydrate them yourself! In general, pulses are ​a category of superfoods that includes chickpeas, lentils, dry peas, and bean varieties. This type of food is extremely sustainable, so the more pulses you eat, the more you can pat yourself on the back for helping the environment! I love tossing beans into salads for a quick protein source, and as of late, I’ve really been into lentils. A few of you have said that you’ve been nervous to cook lentils because you’re afraid you’ll “mess it up” and they’ll become mushy. You know what? I kinda like mushy lentils! They’re soft and bolognese-like. But, if you’re nervous – just keep taste testing until you think they’re right. Remember, everything should be cooked to your preference. After all, you’re not cooking for a restaurant – it’s for yourself, so if you like ’em mushy, have ’em mushy! With today’s dish, we’re infusing our pulses (green lentils) with curry flavors, thanks to garam masala, turmeric and curry powder. 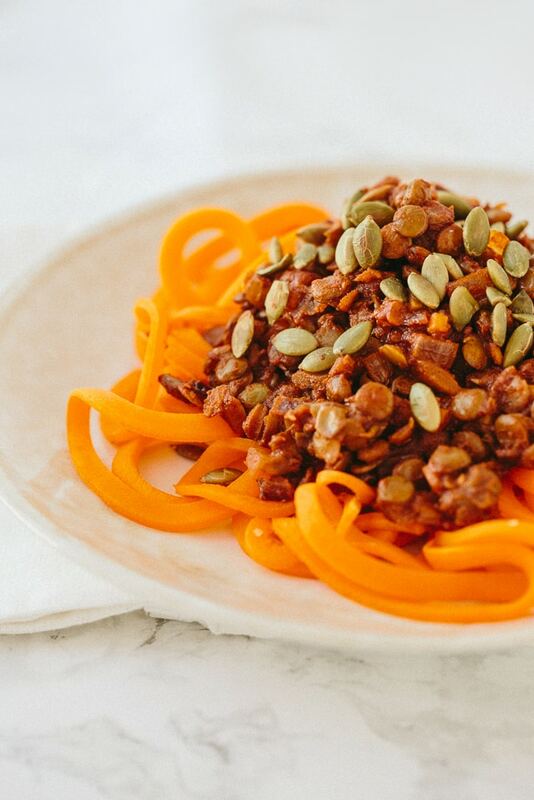 This lentil curry is placed over sweet butternut squash noodles and topped with crunchy toasted pepitas. 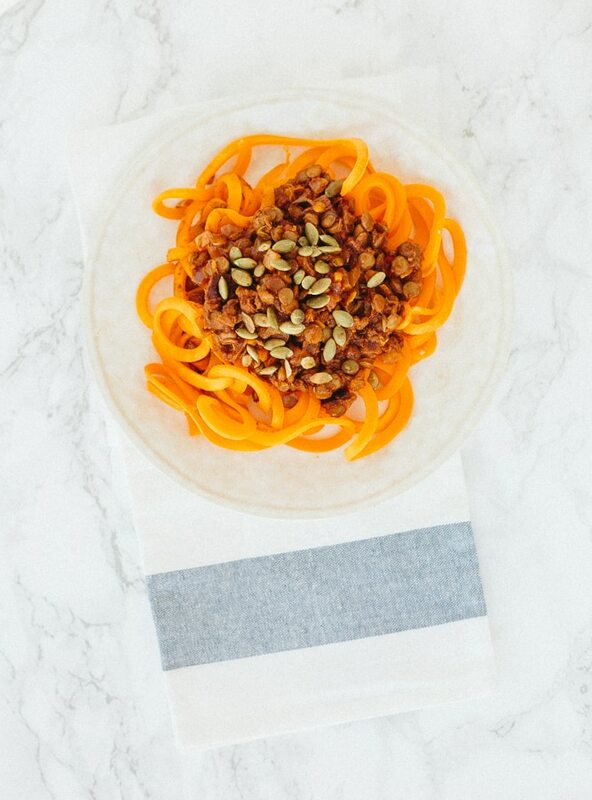 This spiralized dish is packed with nutrients, protein and comes together quickly. It can also be saved for leftovers. What are you waiting for? Eat some pulses with me! Preheat the oven to 400 degrees. Line a baking sheet with parchment paper. Lay out the butternut squash noodles on the sheet and set aside. Place the lentils in a medium pot and add in 1.5 cups of water. Bring to a boil and once boiling, reduce to a simmer and let cook for 15 minutes or until lentils are cooked but not mushy, adding water as needed to keep the lentils moist. While lentils cook, place a small skillet over medium-high heat and once heated, add in the pumpkin seeds. Let seeds cook until golden brown and toasted. Set aside in a small bowl. When lentils are just about done, transfer the butternut squash noodles to the oven and bake for 15 minutes or until cooked to your preference. Meanwhile, place a large skillet over medium heat with the oil and once oil heats, add in the onion, garlic and ginger and let cook until translucent, about 3 minutes. Add in the curry paste and swirl until onions are covered in the paste. Add the tomato sauce, garam masala, curry powder, turmeric, cayenne, and stir until combined. Add in the lentils and let cook for 5 more minutes to strengthen the flavors. 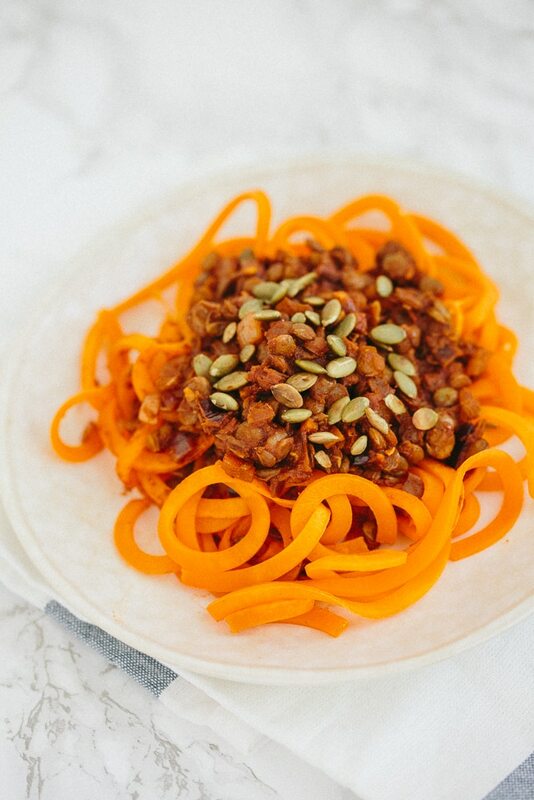 Remove the butternut squash noodles from the oven, divide into bowls and divide the lentil mixture over the bowls and garnish with pumpkin seeds. Ali your pictures are fantastic! They have always been beautiful but for some reason they are looking even more refined lately. I was wondering what camera and lens you use - have you upgraded since you first started photographing food? I have a macro lens and I still can't get my pictures to look this crisp. Maybe it's my lighting? I haven't changed anything, but thank you!! I use a Canon 5D Mark III! so funny! I just printed a lentil recipe to make in the slow cooker right before reading this post. I LOVE that it's the year of pulses. People need to be getting more of their protein from these delicious sources. I changed the heck out of this recipe to use what I had in the house. Carrot noodles instead of butternut squash; toasted almonds instead of pumpkin seeds; red lentils instead of green lentils; ketchup + water + lemon juice instead of tomato sauce; extra spices instead of red curry paste. It was fantastic! This was my first time trying butternut squash noodles. When I spiralized it, only some of the noodles were thick and even like yours in the picture, and the rest were smaller. When I baked them, the small ones were a nice edible texture and the larger ones were still crunchy. Anyone have any tips on this? Finally made this recipe. Had been looking forward to it since you published it. Well, we've decided (hubby and me) that sweet potatoes will be used next time. The recipe lends itself to carrots too. He had a hard time Inspiralizing the butternut squash. Do you have a video 'how to do that'? Hubby does the Inspiralizing and he finished dicing the butternut squash by hand. Which actually made it good size to eat. Actually, I must overcook any of my Inspiralized foods cause they shrink so much. We thought it was going to be bland with 'plain' butternut squash but the 'sauce' makes it. Very good. And we love h-o-t spicy food. Next time I'll make some over fried chicken to go with it. Spiralized foods are going to shrink because the veggies are mostly water. The amount will vary depending on the amount of water in that particular vegetable, but in my experience they lose a good half of their volume. wow! just made this - another winner!! only thing is, my pumpkin noodles fell to bits when i cooked them - not quite mash, but they certainly didn't hold their own in the transfer from tray to bowl, they broke into little bits. Still delicious, but i'd love to know where i went wrong. I sliced the pumpkin and laid it out on a tray, and then I had to go out, so it sat in the fridge for about an hour - could it be that? PUMPKIN noodles? This recipe does not call for pumpkin noodles. Use BUTTERNUT SQUASH like the recipe says. Will work better. butternut pumpkin is another name for butternut squash. woah! calm down! It's the same thing. We finally made this the other night using sweet potato noodles instead of butternut squash. We make daal (indian style lentils) a lot in our house, so we were interested to try this "fusion" version, which we nicknamed "Thai Daal" (over Sweet Potato Noodles). While we overall enjoyed the recipe, but think it was MUCH better with some plain yogurt mixed in just before serving. This helped mellow the spice from the red curry paste and helped meld the other spices. We will definitely repeat this again!